Hello! This is Sherri from A Quilting Life! Chelsi and I are pleased to introduce Walkabout, our seventh collection for Moda Fabrics showing to shops now for a January delivery! 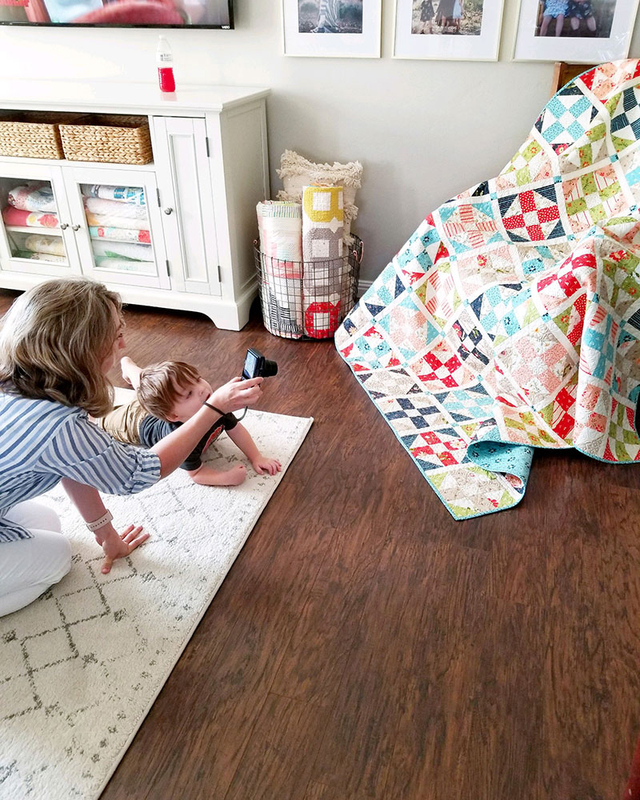 We’ve been sewing up a storm with this fabric since receiving our sample yardage just about a month ago and absolutely love it! We’d love to share our new designs with this beautiful and versatile collection. Sea Glass is a fast and fun Layer Cake quilt in two sizes – 65 ½” x 65 ½” and 65 ½” x 84” – and there is a free mini-size included in the pattern that is perfect for a matching pillow top, wall hanging, or table topper. 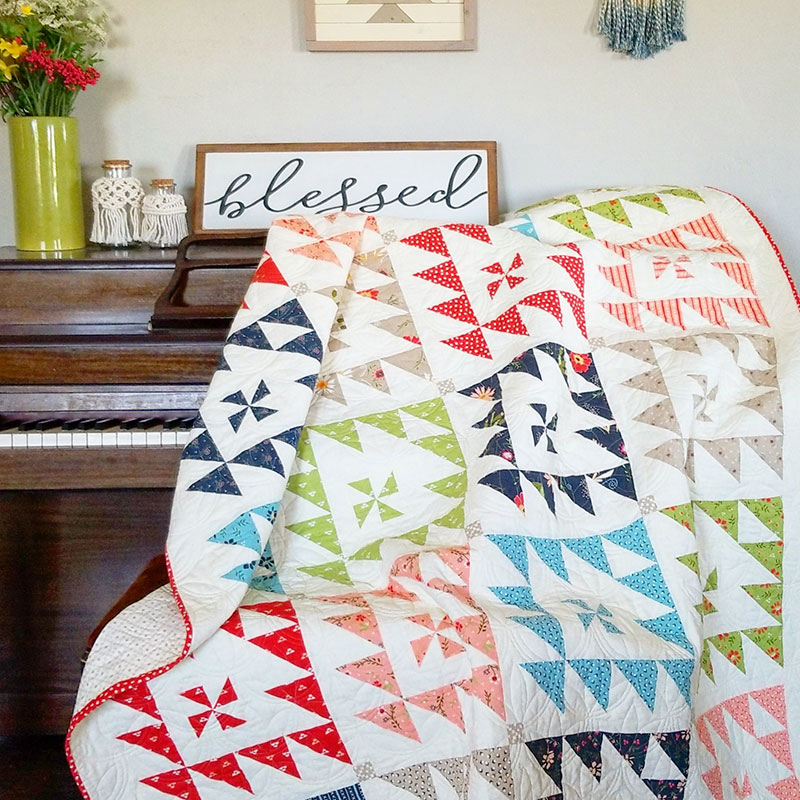 This striking quilt is fast and fun to put together! Waterfront is a fat quarter quilt that finishes at 68 ½” x 68 ½”. This quilt features a striking sashing/sashing post combo with one of our lovely taupe prints for the contrast sashing. Use our beautiful tone-on-tone dainty floral print for the backgrounds in this one. 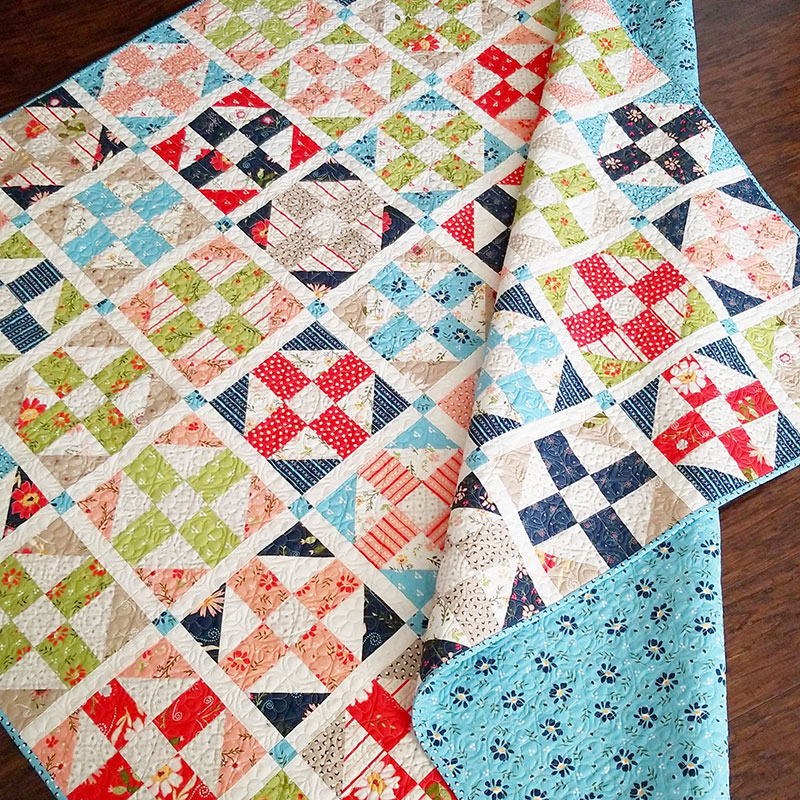 Pathways is a fabulous delightfully scrappy quilt which uses one Jelly Roll and one Layer Cake along with some additional fabrics for block centers, post, sashing and backgrounds. The Pathways quilt finishes at 71 ½” x 71 ½” but can easily be made larger by adding your favorite border print. By using a mix of the low-volume prints in the Walkabout collection you can achieve the look and feel of a scrap quilt! 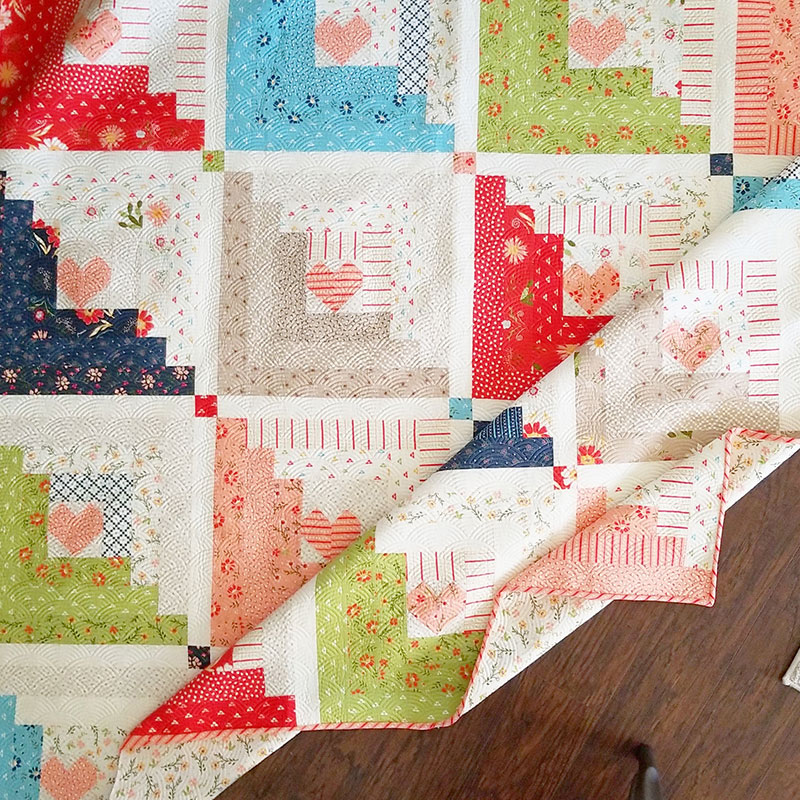 Hearts at Home is another delightful Jelly Roll quilt finishing at 69” x 69.” This quilt uses two Jelly Rolls and some additional background yardage. By using the light prints in the collection you can also achieve a fun scrappy look with these blocks. 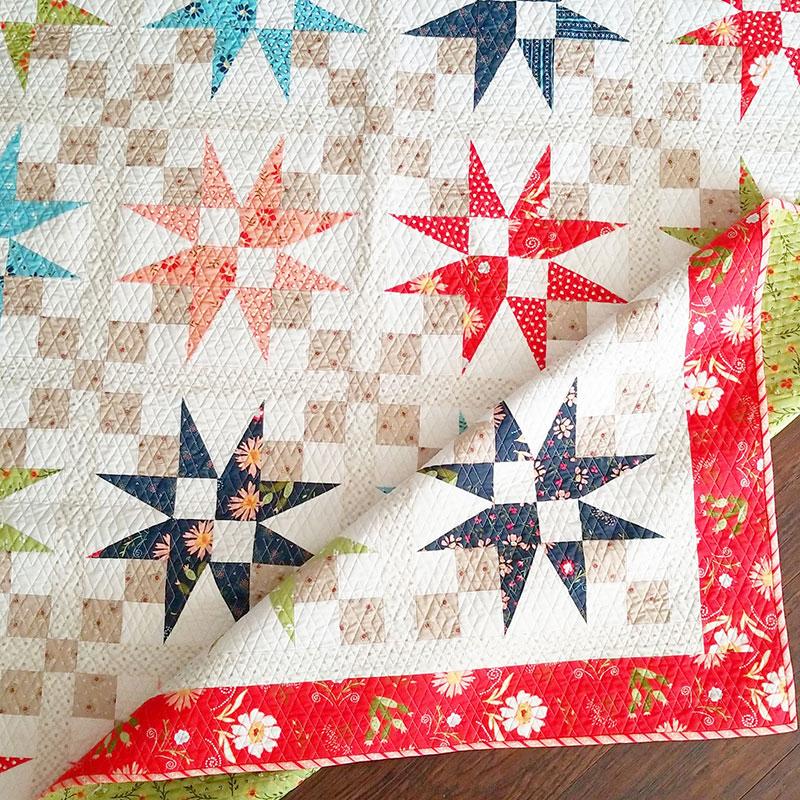 North Shore is a fun half-square triangle quilt with cute pinwheels for the block centers. 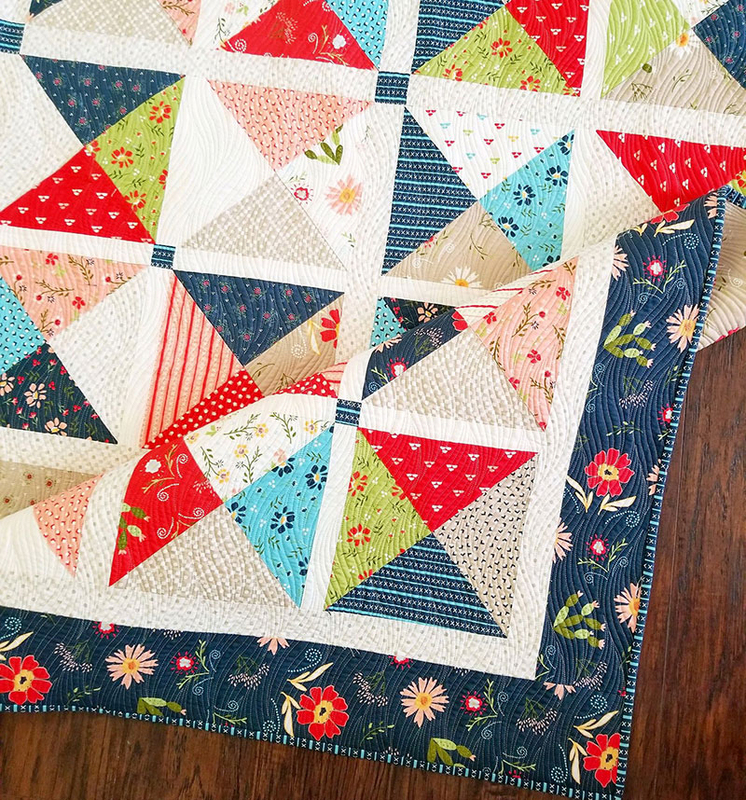 Use a fat eighth bundle to put this darling quilt together. Wander is a striking quilt pieced with triangle in a square blocks and finishing at 78 ¼” x 78 ¼”. 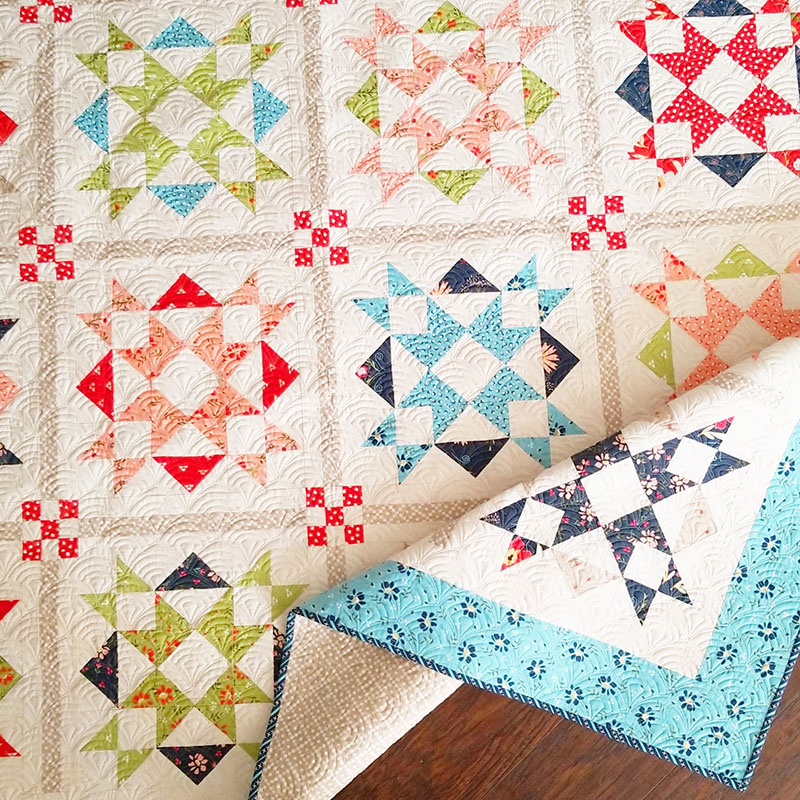 There is a template included for the triangle in a square unit; however, the 4” triangle in a square Bloc Loc ruler is also a wonderful way to make this quilt go together quickly and accurately. 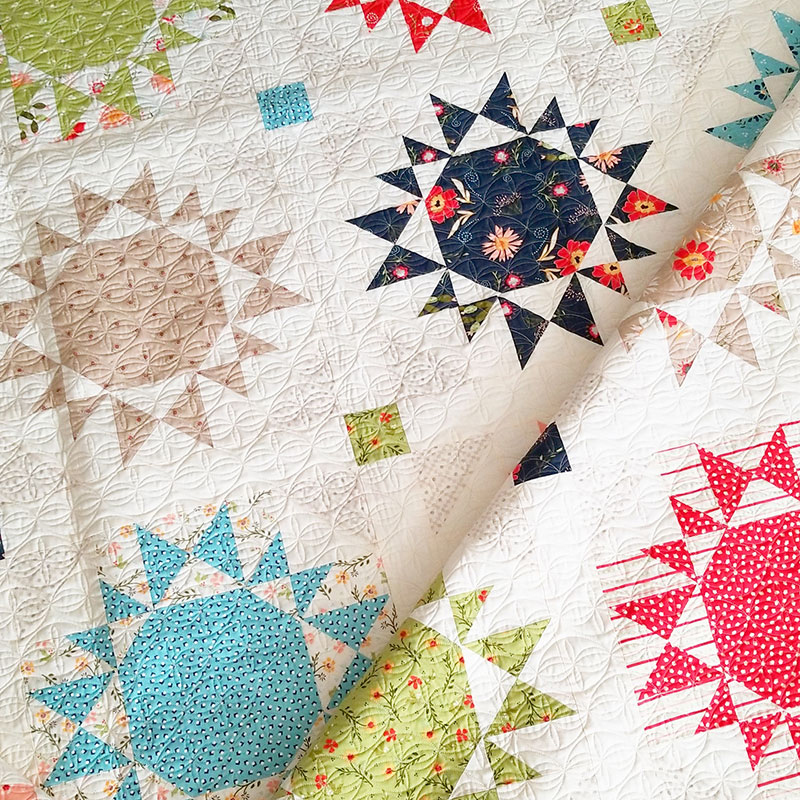 Finally, the Endless Summer Fat Quarter quilt is another option for our beautiful Walkabout collection. Use the cream and taupe Journey print in the collection for a striking but subtle contrast fabric on the block corners—which also creates a fun secondary pattern. Walkabout is a collection with a terrific variety of prints and patterns from small dainty florals to medium and large florals. Our large floral print has a touch of whimsy with the cute cactus design elements. And our stripes, semi-circles, dots, and chain prints make for terrific basics. Walkabout works beautifully with our Clover Hollow collection which has just shipped, too! And many of our prints make terrific home décor fabrics as well as clothing choices. We hope you will enjoy using Walkabout as much as we have! Very pretty fabric line. I love the Hearts at Home quilt. I’m excited to see these prints in quilt shops soon! They are beautiful! I may be wrong, but aren’t these fabrics/patterns from Bonnie and Camille? It looks like their fabrics and I love them too. Please let me know – I thought Walkabout had different looking fabrics (equally pretty). I always enjoy your posts – Thank you! Soooo beautiful. Makes me smile. Your walk about line looks delightful. Thankyou for sharing. I love this post! The fabric is gorgeous and inviting! Where can I find the quilt patterns mentioned in this? (No link for Pathways). I’m ready to cut fabric now……..! I wanna make them all! This is such a delightful line- I am looking forward to making one of them. Help me decide! I love this collection! The taupe, especially, is a wonderful addition and is going to partner with the dark blue so well. I can’t wait to bring some home and start quilting. I have a pattern chosen already and Walkabout has been on my Wishlist since before the holidays. The fabrics are lovely-can’t wait for them to be in the quilt stores. I would love to know where I can purchase the patterns e.g. Hearts at Home, etc. Beautiful collection and I love the picture of you and Finn. Very, very nice collection. Three of your quilt patterns I would use! Do you sell your patterns? How do I find out whose got your fabric? Me too. She was a very special lady and I think of her often. I hope all is well with you! I’m well, just slowed down a bit. Still produce some quilts and enjoy going to 2or3 retreats a year. Do you you have any new books or patterns? Just started quilting. I love these!!! 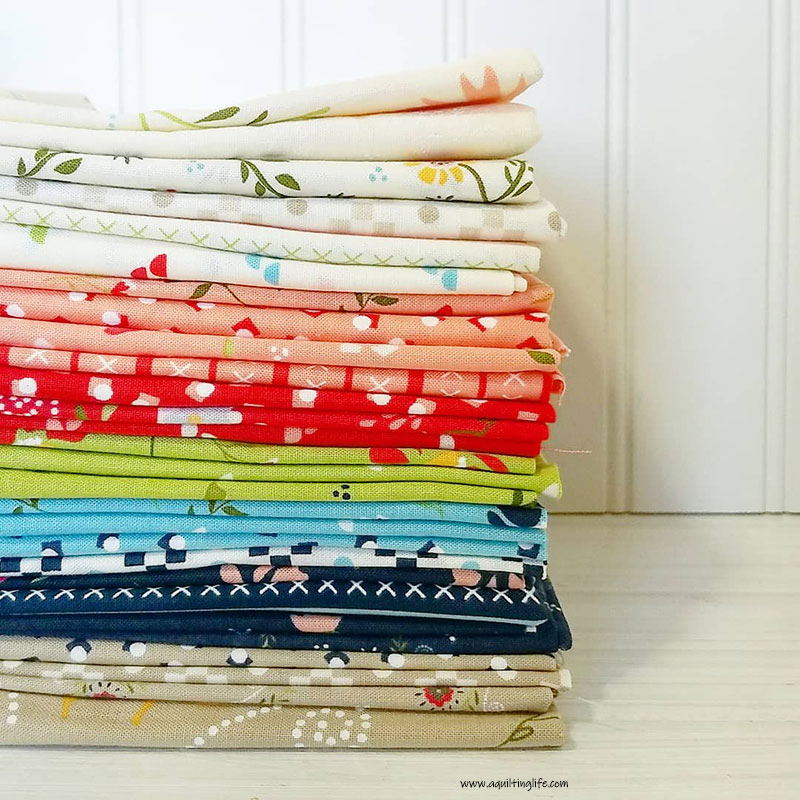 Love the collection and especially the “Hearts at Home” quilt done in this fabric. Is there somewhere to purchase the quilt pattern? love the new fabric…where can i find the Hearts at home pattern ?